With the assistance of our deft team of professionals, we are able to introduce a broad array of Replacement Parts of Atlas Copco Compressor. We have complete range of Atlas Copco compressor spares for GX 2-11, GAR 5-37, GA 5-11, GA 15-22, GA 200-500, GA VSD series and GAE/ GAE VSD series model. In addition, our product range also comprises of air compressor filters, air compressor sensors and air compressor valves. Entire parts are developed and designed adhering to defined international industry standards at our vendor’s end. Supplier & Manufacturer of Compressor Replacement Spare Parts. Our product range also comprises of Air Compressor Filters, Air Compressor Sensors and Air Compressor Valves. 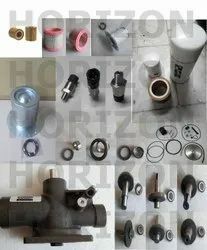 Our highly appreciated range of Compressor Replacement Spare Parts is available in various specifications. This range is manufactured using high grade raw material that are procured from reputed vendors. Known for durability and wear & tear resistant, our range is in line with defined industry standards. we have complete range of atlas copco compressor Replacement spares for gx 2-11, gar 5-37, ga 5-11, ga 15-22, ga 200-500, ga vsd series and gae/ gae vsd series model.